Daisy makes the world’s best air guns and they also brought out this gun, which is similar to the Power Line 5171 model, with a range of additional items. It’s a man-made .177 cal. power for the future. If the mean appearance of your firearm is just as important as the features you seek in it, this Daisy Outdoor Products 5171 Review (semi-auto pistol) will shed some light on exactly what to look for to strike a balance between outward appearance, price and performance features. The Daisy 5171 is one of the powerful semi-automatic pistols in the market. It also comes equipped with a drop out magazine and trigger block safety. Blade front and back sight also make it an efficient shooting accessory. It comes equipped with a steel smooth bore barrel and a 21 shot capacity clip. The maximum velocity it provides with 1.77 caliber pellets is 520 feet per second. Using CO2, this semi-automatic powerful pistol can provide the most precise shots. With the right equilibrium and the perfect trigger pull, it can easily reach any object within a considerable distance. If you’re looking for an air pistol that’s a little bit more ‘real’ looking, check out our Winchester Model 11K Air Pistol review. It’ll cost about $10-$15 dollars more, otherwise you can also check out our Umarex Beretta Pistol PX4 Storm review for the same reasons. The Daisy 5171 is one of the meanest looking and efficient BB guns in the world. Though it is a tad bit difficult to assemble, but once fixed it’ll be a standout among the rest of the BB guns in the market. Utilizing the red dot scope, it’s very easy to hit small games and pests. Amateurs can experience the comfort of professional shooting with Daisy 5171 BB pistol. This gun can cover at least 254 yards distance with its laser dot sight. This is good for small pest control and plinking. This gun is reasonably priced for beginners. It also doesn’t hurt that it comes with a yearlong warranty from the manufacturers. It comes with a manual trigger safety which makes it safer around children. 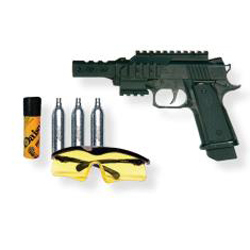 You can hone your shooting skills very safely with this pistol. Laser light, scopes, and sights provide the most accurate shot possible. Standard 12-gram cartridges can be self-loaded, which is very easy for most of the newbies who are trying new guns in the market. It is a double action BB repeater, so follow up shots can be easily provided. Daisy BB 5171 BB repeater comes equipped with a lower and upper rail that comes very handy while mounting optics into the gun. 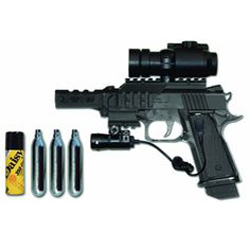 It is a powerful smooth bore survival pistol that shoots very well from the start. It is a little big for people with smaller hands. It creates a loud noise while shooting. Looks a little cheap as it has a plastic body. Loading CO2 inside those cartridges is a bit tricky. The trigger is a bit hard to pull. This Daisy Outdoor Products 5171 Review demonstrates the exceptional ability of some manufacturers to cater to more than one gun consumer requirement at a time, and is by far the meanest looking BB gun in the market that will provide you with the most effective shots. It is perfect for professionals who want something that looks mature their hands. Considering its price range, it’s one of the most powerful BB from Daisy. It is a genuine firearm so precaution is very necessary while handling this gun.